In a world where musical authenticity is constantly being called to question, anti-folk icon, Paleface, is as real as they get. After nearly three decades of writing and performing music, Paleface remains true to his craft and continues to create art that is raw, fresh, and inspired. Paleface’s music career is much like a collection of short stories, woven together with unpredictable highs and lows—each chapter marked with different shades of joy, sorrow, chaos and control. Throughout it all Paleface has managed to come out on the other side with tales to tell. Paleface got his start playing music at NYC clubs in the late 80s, rubbing shoulders with creative minds like Daniel Johnston and Beck. While being managed by the legendary Danny Fields, Paleface signed a major-label record deal, began putting out albums, and touring with bands like Crash Test Dummies and The Breeders. Everything appeared to be falling into place, but by the late 90s Paleface’s partying lifestyle caught up with him, nearly taking his life and forcing him to reevaluate his direction. By 2000, a sober Paleface found himself among a new crop of imaginative musicians in NYC, many calling themselves “anti-folk.” Artists like Kimya Dawson, Regina Spektor, and Langhorne Slim shared the stage with Paleface, and he soon became an integral part of the anti-folk scene. It was during this period in his career when Paleface struck up a friendship with Scott and Seth Avett (The Avett Brothers). This instant artistic connection ultimately drew him, and girlfriend/drummer Monica “Mo” Samalot, away from New York in 2008 to start a new life in Concord. After moving to North Carolina, Paleface and Samalot hit the road, touring as a high-energy folk-rock duo throughout the United States and Europe. Paleface continued to record and release albums like the self-released “A Different Story” as well as “The Show Is On The Road” and “One Big Party” on Ramseur Records. Studio and on-stage collaborations with The Avett Brothers exposed a whole new audience to Paleface’s music and it appeared that his momentum had shifted up again. However, a health scare and setback in Europe while promoting “One Big Party” forced the pair to take time off to regroup, yet again. Unable to tour, Paleface spent time focusing on getting healthy and painting — a talent he had discovered while living in NYC. 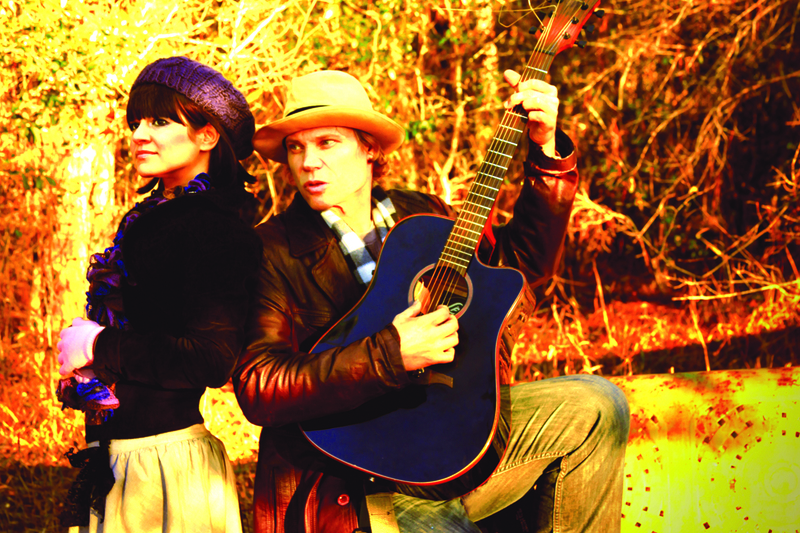 Paleface creates bright, bold, music-inspired folk-art. His canvas and drum head paintings often carry uplifting themes, much like his music, and he sells them as special one-of-a-kind merchandise at shows. In reality the paintings help to supplement the often stretched-thin income of a touring independent artist. Life on the road is difficult, but Paleface has managed to stay positive after all of these years. Paleface has been touring through Greenville for several years, a stop that he may have missed had it not been for his connection with the Avetts. While the Avetts may have brought Paleface to Greenville, Samalot keeps the duo coming back. She is the driving force when it comes to the business side of things — mapping out tour routes, booking venues, handling all social media—in addition to rocking the drums and singing harmonies. Paleface and Samalot are partners in every sense of the word. On and off stage their mutual respect and love is unmistakable and they are constantly pushing each other to improve. When it comes to songwriting, Paleface’s talent is off the charts. He is a true storyteller, creating a unique auditory experience that reaches all ages. Paleface’s ability to write songs with traditional acoustic instrumentation that ends up feeling charged and electric is unmatched and magical. As he begins another new chapter in his career, Paleface is approaching his newest material from a more informed and introspective place. Though it has been challenging, he is confident that his approach will yield some of his best music to date. Until then, fans can catch Paleface touring across the country. This month, Paleface will once again make a stop in Greenville to close out Spazz Fest VI at Christy’s Europub on March 22 from 7-11 p.m. Fans can expect Paleface to deliver another fun and lively performance, full of some of his best old tunes, a few new ones and plenty of audience interaction. “I want [the audience] to feel the energy and give it back so we can both bug out to the sound vibrations,” Paleface said. This piece originally ran in Mixer Magazine.